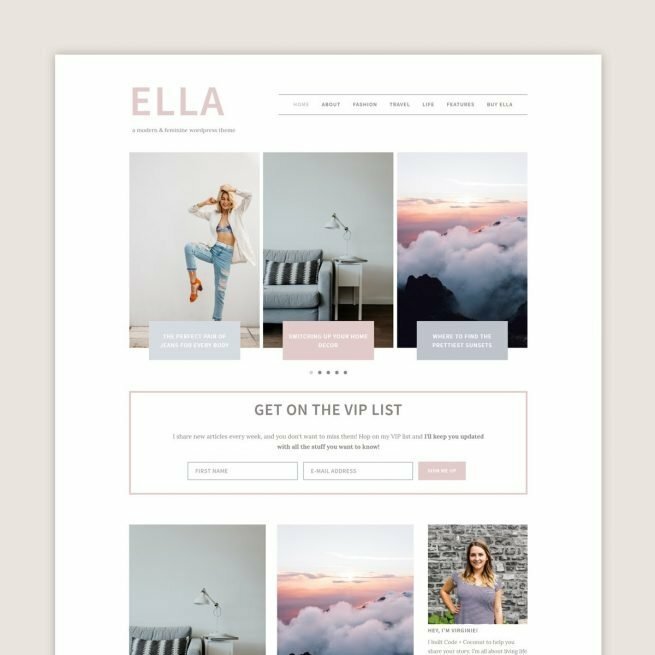 Ella is a modern and feminine WordPress themes that will be a great base to build your blog on! If you’ve been searching for a theme that combines a minimalist design with a colorful palette, Ella is what you’re looking for. Not sure pastel colors are for you? That’s totally fine! You can customize all three accent colors of Ella to whatever your heart desires. Use the full power of the new Gutenberg editor! Ella is optimized to look as good in the editor as it looks on the page. All the blocks have been styled to fit the rest of the website, so you can easily create pages instead of fumbling with code. You’ll be able to adapt your new website to your brand, without needing our help to do it! You can change the main color and the accent color to whatever your heart desires. All of our themes look great whether you’re on your desktop, your tablet or your phone. We know just how important responsive design is and we don’t want you to have to worry about this. No need to touch any code, uploading your own logo is easy as pie! We want you to look your best, so we’re giving you all the tools to get there! We know how important vertical images are to your blog, and we want you to be able to showcase them! Displaying the carousel is optional, but we think it rocks! Add as many widgets as you want to your homepage to make it more like you! We want you to be able to customize your homepage (it’s your most important page after all!) to your heart’s desires. Add a newsletter signup after each blog post, add your signature at the end of your post, add a search button and/or a second menu to the top bar, etc. There are so many options you can play with! Instagram is aaaaah-mazing and we want you to display your best images on your site for everyone to see! (And, you know, for people to follow you there too!) You’ll be able to add your feed in your footer in just a few clicks. Plugins are an amazing way to add functionality to a website! We have a few favorites, and made sure to integrate them with Ella! Simple Social Icons, Instagram Feed and Jetpack are a few of those! Note that you will need to purchase your own license of the Genesis Framework*. It isn’t included with your purchase. Lifetime updates of the Ella theme. Access to all our themes documentation and helpful guides. Code + Coconut themes can only be installed on self-hosted WordPress websites and require your own license of the Genesis Framework* to work. To make sure the installation process goes smoothly, it is recommended to have all these things lined up first, before buying the theme. Buy a domain name. If you haven’t done this already, we recommend buying from Namecheap* as they offer a really great service! Buy hosting. To be able to have a self-hosted WordPress site, you need to buy hosting. We highly recommend SiteGround* if you haven’t bought it already. Install WordPress. Once you’ve bought your domain name and host, it’s time to install WordPress on your server. Most hosts will give you a one-click install option that’s super easy to do! You’ll know it worked when you have a fully functioning website that you can log into. Buy a Genesis Framework* License. If you’re a new blogger, chances are you won’t have a copy of the Genesis Framework already. It’s important to get your own copy, otherwise, you won’t be able to install this theme.